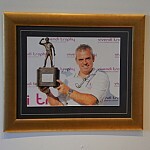 With so much golfing heritage on our doorstep, no wonder Sports Legends is a leader in golf memorabilia. Links courses surround us. England's oldest links course, Royal Liverpool, is only a short hop as the crow flies. Royal Birkdale is closer still. And a short stroll from our doors sits Royal Lytham and St Annes. On a coastline punctuated by Open Championship golf courses it's perhaps appropriate that a treasure trove of golf collectibles and signed golf memorabilia is based among them. 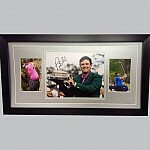 Sports Legends' autographed golf memorabilia spans the last 50 years of the game. Signed golf photos of luminaries such as Arnold Palmer and Bernhard Langer mingle with golf stars of the modern era such as Tiger Woods and Rory McIlroy and help bring you closer to the action. They could make a worthy addition to your clubhouse golf memorabilia or prove a popular and valuable source of income when you use them as part of a charity auction. 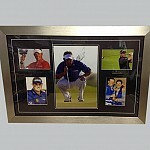 We care passionately about the golf memorabilia you hang on your wall. 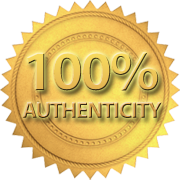 We're committed to authenticity, and we offer an expert framing service to protect your golf memorabilia and collectibles and create a brilliant display piece. 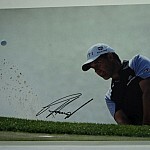 We're also committed to keeping our prices low, so every fan has a chance to own their perfect piece of golf history. 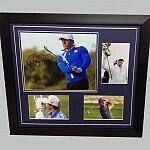 Add to your golf memorabilia collection. Give it as a gift. Treat it as an investment. Whatever you plan to do with your signed golf memorabilia and collectibles, find a better choice - and the best value - at Sports Legends.